President Donald Trump’s businesses received nearly $3.8 million from political committees during the two-year 2018 campaign cycle, according to the latest disclosure reports. The top political customers: Trump’s re-election campaign and the Republican Party. Trump’s campaign committee spent more than a million dollars at Trump businesses during the midterm elections, including renting space at the Trump Tower in New York City, according to disclosures filed with the Federal Election Commission. Throughout 2017 and 2018, Trump hotels in Chicago, Las Vegas, and Washington and golf clubs in Virginia, Los Angeles, Miami and Bedminster, N.J., cashed in as well, as venues for events by political groups large and small. 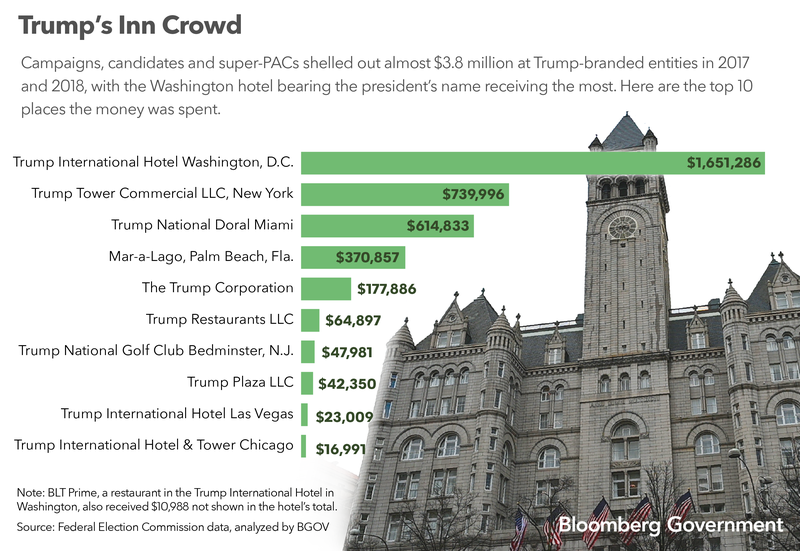 Candidates and political operatives also billed hotel stays to Trump’s network of luxury resorts. “The Trump properties are great venues with professional staff and exceptional service,” said Erin Montgomery, communications director for America First Action, the super-PAC arm of America First Policies. America First Action spent $394,400 at multiple locations, primarily the Trump International Hotel Washington, D.C.
To critic Craig Holman of Public Citizen, the spending is one part of a web of conflicts. “You’ve got lobbyists, you’ve got foreign governments, you’ve got government agencies — on the state, local and federal levels — and you’ve got campaigns all trying to throw money at the feet of the president in order to endear themselves to him,” Holman said in an interview. Donald J. Trump for President and Trump Victory, a joint fundraising venture of Trump’s reelection campaign and the Republican National Committee (RNC), spent $1.15 million and $162,900, respectively, at Trump-branded entities. More than $822,000, or 72 percent of the $1.15 million disbursed from the Trump campaign, was itemized as rent at Trump facilities, according to a Bloomberg Government analysis of campaign disclosures. The campaign also spent a cool $1,769 at Trump Ice, the president’s bottled water company. Expenditures at Trump properties were a fraction of the $55.9 million spent by Trump’s campaign organization during the election cycle and an even smaller slice of the $326 million spent during the two-year period by the RNC. The RNC spent more than $1.2 million at Trump’s hotel in Washington, at the private Mar-a-Lago resort in Palm Beach, Fla., and at the Trump National Doral in Miami, among others. About $855,000 of that was for event space and catering and $414,000 was for travel expenses at the president’s clubs. Various GOP joint fundraising committees spent a total of $520,708 in the 2018 election cycle at Trump businesses. Protect the House, a joint committee comprised of GOP House members and state Republican party committees, spent $232,837 for events and catering at Mar-a-Lago, Trump’s golf course in New Jersey, and the Trump International Hotel in Washington. State Republican party committees spent less than $20,000 in 2017 and 2018 at Trump properties. Congressional candidates spent almost $165,700 on Trump-branded purchases, and 15 Republican leadership PACs collectively spent about $138,000 on fundraisers, meals and lodging at Trump entities. Great America Committee, a leadership PAC founded by Vice President Mike Pence, comprised about 90 percent — or $124,349 — of that total. Conservative super PACs reported spending $453,701 at Trump properties. America First Action, the super-PAC stocked with Trump alums and funded by wealthy Republican donors, represented about 87 percent of that total. The group booked hotel stays, held meetings and threw fundraisers at Trump’s Washington hotel. The expenditures also included an event at Mar-a-Lago and travel to the president’s hotels in Las Vegas and New York. “Our supporters have been enthusiastic and happy when we’ve hosted events at those locations, and we look forward to continuing to do so in the future,” Montgomery, the group’s spokeswoman, said in an email. The American Pro-Israel PAC (APIP), a super PAC created last year and run by pastor Ramiro Peña, spent $38,872 at Mar-a-Lago in November when it held a “grand opening APIP gala”, its website notes. Peña had served on a Trump campaign Hispanic Advisory Council. The campaign of Rep. Greg Pence (R-Ind. ), the elder brother of the vice president, reported spending nearly $23,000 at Trump properties, primarily on lodging. Part of that amount included $7,282 for a fundraiser at the Trump International Hotel in Washington. Trump’s refusal to divest from his businesses has prompted lawsuits from the state of Maryland and the District of Columbia, by watchdog group Citizens for Responsibility and Ethics in Washington (CREW), and from Democratic members of Congress. The lawsuits allege that the president has violated two parts of the Constitution known as emoluments clauses, one that prohibits public officials from receiving gifts from foreign governments, and another that says a president may not receive an “emolument” from U.S. federal or state governments beyond his salary. Trump properties earned more than $16 million from spending at his properties and restaurants by Republican groups, his campaign and federal agencies from 2015 until mid-2018, according to ProPublica, which cites FEC reports, state records, and documents obtained by a group called Property of the People through open-records requests. More than 80 percent of that total came from his own campaign, primarily from his airline TAG Air, according to the ProPublica report.